“That should be in every mommy’s medicine cabinet.” With this simple statement, the concept of Mommy’s Medicine Cabinet was born. As parents of three children, founders Priscilla and Mike Thomas knew that having a sick child affects the entire family. They also knew that this is especially true when your basic family medicines are either expired or not in the medicine cabinet at all. Priscilla and Mike envisioned a comprehensive kit of commonly used over-the-counter medicines that moms could rely on being there, ready to go, when their children were sick or injured. Mommy's Medicine Cabinet™ is the go-to-product when our most precious assets, our children, are sick or injured. We understand the worry and chaos a sick child can bring to your day…or night! Mommy’s Medicine Cabinet™ is a doctor-recommended, well-organized bag of the most frequently used, non-prescription medicines and first-aid products (and it’s pretty too!). No more reaching for a medicine only to find that it is expired. No more checking every lot number in your medicine cabinet to ensure that it is not affected by the latest recall. 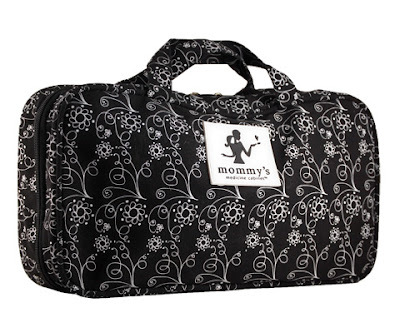 No more making lists for vacations, weekend or overnight getaways; our bag will keep you prepared at all times and give you the peace of mind that you can confidently take care of your children. Mommy's Medicine Cabinet™ will notify you when the products you purchase from us are about to expire or if they have been recalled by the manufacturer or the FDA. Just grab, run, and have fun! As a mom, I naturally try to keep everything that I think I'll need on hand just in case an emergency is to arise or one of the kids get sick. There can always be those instances though where your child comes down with something that your not quite prepared for. 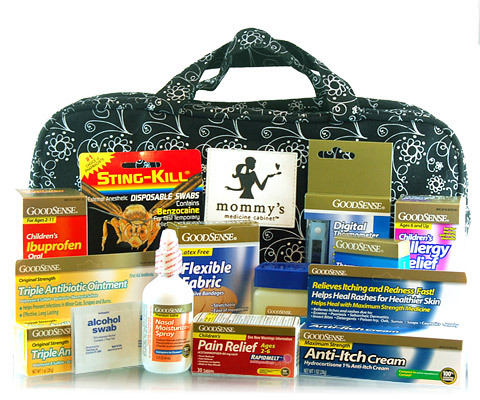 In those instances, the wonderful new all in one kits by Mommy's Medicine Cabinet will come to the RESCUE! Essential item's that are necessary just in case your little one gets sick (at home, or on the go) are all packed in their stylish "Kate Bags" (Pictured Above Top). Whether your planning for an infant, toddler, older child, or your entire family.....there's a "Medicine Cabinet" to fit your families individual needs! The peace of mind that the Mommy's Medicine Cabinet brings, in knowing that I'm prepared, is priceless! No need to worry about recalls or expiration dates either! Mommy's Medicine Cabinet allows you to register your kit online, and they will send you any necessary updates or recall alerts about the contents of your kit ...directly to your email! The Mommy's Medicine Cabinet offers an extensive base collection of must have item's that every Mom / Parent should have on hand - these kits would make the absolute perfect baby shower or new parent gift! EVERY Mom /Parent /Grandparent should have a Mommy's Medicine Cabinet on hand. Children’s Ibuprofen liquid 4 oz. Triple Anti Bacterial Ointment 1 oz. Visit http://www.mommysmedicinecabinet.com/ and let me know which Medicine Cabinet you would like to have on hand for your family. The comment is considered your entry. Entry to this giveaway ends at 12pm PST May 22, 2011. Winner's are chosen randomly through random.org.The winner will be announced in a post within 7 days of the giveaway ending, and contacted through email. The winner will have 48 hrs. to respond or another winner will be chosen. The deluxe would be great. I'd love to have the Children's Medicine Cabinet on hand for our family. 1 I follow Mommy's Medicine Cabinet on TWITTER. 2 I follow Mommy's Medicine Cabinet on TWITTER. 3 I follow Mommy's Medicine Cabinet on TWITTER. 4 I follow Mommy's Medicine Cabinet on TWITTER. 5 I follow Mommy's Medicine Cabinet on TWITTER. 6 I follow Mommy's Medicine Cabinet on TWITTER. 7 I follow Mommy's Medicine Cabinet on TWITTER. 8 I follow Mommy's Medicine Cabinet on TWITTER. 9 I follow Mommy's Medicine Cabinet on TWITTER. 10 I follow Mommy's Medicine Cabinet on TWITTER. 1 I "Like" Mommy's Medicine Cabinet on FACEBOOK. 2 I "Like" Mommy's Medicine Cabinet on FACEBOOK. 3 I "Like" Mommy's Medicine Cabinet on FACEBOOK. 4 I "Like" Mommy's Medicine Cabinet on FACEBOOK. 5 I "Like" Mommy's Medicine Cabinet on FACEBOOK. 6 I "Like" Mommy's Medicine Cabinet on FACEBOOK. 7 I "Like" Mommy's Medicine Cabinet on FACEBOOK. 8 I "Like" Mommy's Medicine Cabinet on FACEBOOK. 9 I "Like" Mommy's Medicine Cabinet on FACEBOOK. 10 I "Like" Mommy's Medicine Cabinet on FACEBOOK. 1 I entered your XO Laptop + Betty Crocker Prize Pack Giveaway. 2 I entered your XO Laptop + Betty Crocker Prize Pack Giveaway. 3 I entered your XO Laptop +3Betty Crocker Prize Pack Giveaway. 4 I entered your XO Laptop +3Betty Crocker Prize Pack Giveaway. 5 I entered your XO Laptop +3Betty Crocker Prize Pack Giveaway. 1 I entered your Little Tikes Cozy Truck Giveaway. 2 I entered your Little Tikes Cozy Truck Giveaway.